Randy and Annette and their children moved to Kiev, Ukraine, on July 18, 2001. The first two years were spent in formal study of the Russian language, during which time they also began to learn about and participate in the Ukrainian culture. In October 2003, Randy was appointed to serve as the Assistant to the President of Kiev Christian University (KCU). In this position he assisted the president in directing the affairs of the university. Together they worked to develop KCU into an institution that would facilitate the training of students from the countries of the former Soviet Union. A new curriculum was written, the school was reorganized and restructured, and its academic standards were raised. Randy also taught two courses at the university. 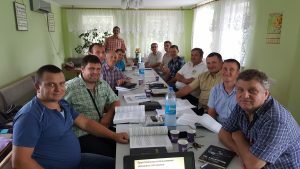 Once KCU had a qualified Ukrainian team in place and things running smoothly, Randy began to focus on his purpose for coming to Ukraine, that of pastoral training. This had been his desire since shortly after salvation in 1982. In 1994 he made his first trip to Ukraine with a group of pastors, and while on that trip his passion for this ministry was revived. Then in 1996, he went to Russia to train men for two weeks who were preparing to become pastors and missionaries. The following two weeks he spent in Ukraine with a Ukrainian church planter. This too helped him focus on what God was calling him to do in the future. To accomplish his goal, he began a ministry called Dynamic Church of Eurasia, and wrote his first book, “Building a Dynamic Church.” It has been translated into Russian, French, Farsi and Burmese, and has been downloaded in many countries throughout the world. His desire is to see it used in the 15 countries of the former Soviet Union. The book is a practical ecclesiology with an application section for most of the chapters. The goal is to help church leaders reexamine their ministries in light of the Scriptures, asking themselves the question, “Why do we do what we do?” The material can also be used to train church planters and cross-cultural missionaries. His second book, “Evangelism: How to Mobilize Your Church,” is designed to help church leaders prepare their members to be involved in evangelism. His third book, “Persecution: A Biblical Perspective,” was written to help and encourage the persecuted church. His fourth book is titled, “Marriage, Divorce and Remarriage: A Biblical Perspective.” Randy’s fifth book is titled, “To Serve or not to Serve? Can Christians serve in the Military. A Biblical Perspective.” His books along with other materials are in English, Russian, French and Farsi and can be downloaded at this website using the “Resource” link. Annette’s main ministry consists of providing Christian resources to women for use in their ministries or personal growth. This involves purchasing many requested resources for home Bible studies, Sunday School, evangelistic outreaches, VBS, tracts, Bibles, DVDs and books for lending libraries, as well as Christian magazine subscriptions. Both she and Randy have taught English clubs for many years as an evangelistic outreach to university students, in which Annette also offered them free Christian books at the conclusion. They both help with Vacation Bible Schools during the summer. Randy plans, prepares and teaches the Bible lessons, while Annette plans, prepares and teaches the crafts for the children. Annette also travels and teaches with Randy. Her teaching ministry is to pastors’ wives and other women using lessons based upon the book, “One With a Shepherd,” by Mary Somerville (used with permission), as well as others that she has written. They focus on marriage, parenting, money, forgiveness, hospitality and discipling women to name a few. She offers Christian books for sale during her seminars and regularly has a book table at her church in Kiev. 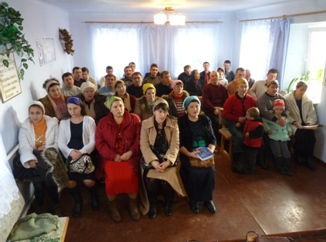 Currently she offers free Christian books and magazine subscriptions through a monthly ministry to widows and their children due to the ongoing war in Ukraine.